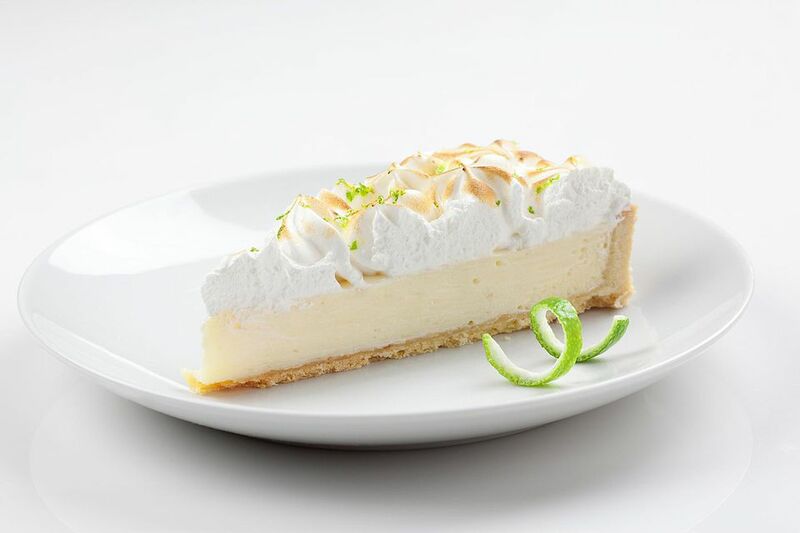 This popular Key lime pie is made with Key lime juice and freshly grated lime. The pie is topped with a meringue topping. And if you're looking for a Key lime pie without sweetened condensed milk, this is a great choice. Use a prepared purchased pastry shell, refrigerated pastry, or a homemade crust, such as this food processor pastry or the all butter pie pastry. In a saucepan over low heat, combine 1 cup plus 2 tablespoons sugar, 1/3 cup cornstarch, 1/2 teaspoon salt, and 1/4 cup cold water. Mix well; add hot water. Continue cooking, stirring constantly, until very thick. Remove from heat; stir in lime juice and return to heat. Cook until thickened, stirring constantly. In a small bowl, whisk the egg yolks lightly. Whisk in about 1/3 cup of the hot mixture and then return egg yolk mixture to the saucepan mixture and cook for about 2 minutes longer, stirring constantly. Add the butter and lime zest and let the filling cool. Meanwhile, prepare and bake the pie shell. Pour cooled key lime mixture into the baked pie shell. Beat the egg whites until stiff; gradually beat in the 6 tablespoons of sugar and dash of salt. Spread the meringue over top of the Key lime pie. Bake for 20 minutes at 300 F, until the topping is nicely browned.